Facebook is a most popular social networking site. Nowadays, Most of the people use the Facebook from their mobile phones rather than desktop/PC. Facebook provides its different versions for mobile phones and desktop. Almost everyone uses the Facebook app on their smartphone to access the Facebook. With a Facebook app, you can access the mobile version of a Facebook. But, sometimes you may need to open Facebook computer version on the mobile phone. So, here is how to access facebook desktop version from a smartphone. Though Facebook also provides the link to open or access its old basic mobile version (mbasic.facebook.com). So, you can open all versions using a browser rather than the Facebook app. 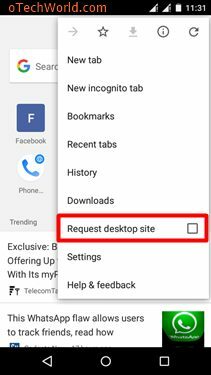 Many people also do search for Facebook desktop view and want to open facebook full site on their iPhone or Android smartphones. When you open Facebook from your smartphone browser, then it redirects to its mobile version. Though mobile browsers also give the option (Request Desktop Site) to access desktop versions of all websites. But, you can also access Facebook computer version with the direct link. You need to open https://facebook.com/home.php link from your mobile browser. Type facebook.com/home.php (don’t forget to type /home.php) in browser URL. You can bookmark this link for future use. This is the easiest way to open Facebook desktop version. Popular mobile browsers like Chrome and Safari that are inbuilt browsers in Android and iPhone smartphones. Both browsers provide the option to access the desktop version of any website. So, you can also use this option for Facebook. Although, you can access any other website by enabling this option. Chrome browser provides the “Request desktop site” option to do this. Open Chrome browser on your Android smartphone and tap on the three vertical dots on the top right corner of the screen. After that, Tap on the “Request desktop site” option to enable this option. After enabling this option, open Facebook by type facebook.com in URL section. You will see the full desktop version of Facebook on your mobile screen. iPhone also allows to opening desktop versions of websites. The safari browser gives the “request desktop site” option to do this. You can enable this option in two ways. First Method: Open Safari browser on your iPhone and open facebook.com. After that, tap on the share button and swipe the lower menu to the right. Tap on the Request desktop site option. Second Method: Open Facebook in safari browser and tap and hold on the refresh icon on the top right of the screen. You will see the Request Desktop site option. Tap on this option to access Facebook full site on iPhone. Open Safari browser and type facebook.com in URL. It redirects to the mobile version of the website. After that, tap on the address bar (URL) and you will see the Request desktop site option. Tap on this option to access Facebook computer version. So, guys, this is how to open Facebook computer version on mobile phones. Though, the mobile browser gives the option to do this. But, you can do this for Facebook with its direct link. You don’t need to turn on or off the browser option again and again. Just bookmark the link and you can access the desktop version of Facebook anytime.